It's Blog of the Week time again. Every week a different blogger walks us through their Filofax blog. 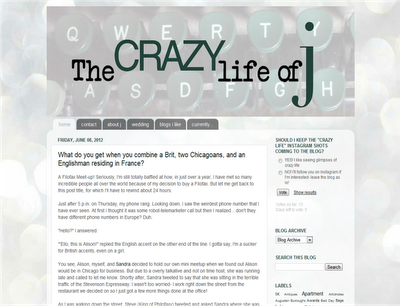 This week, it's J who walks us through The Crazy Life of J. My blog has been constantly evolving. It started in July 2010 as JB Househunt as a way to track me and my fiance's progress in buying our first home. 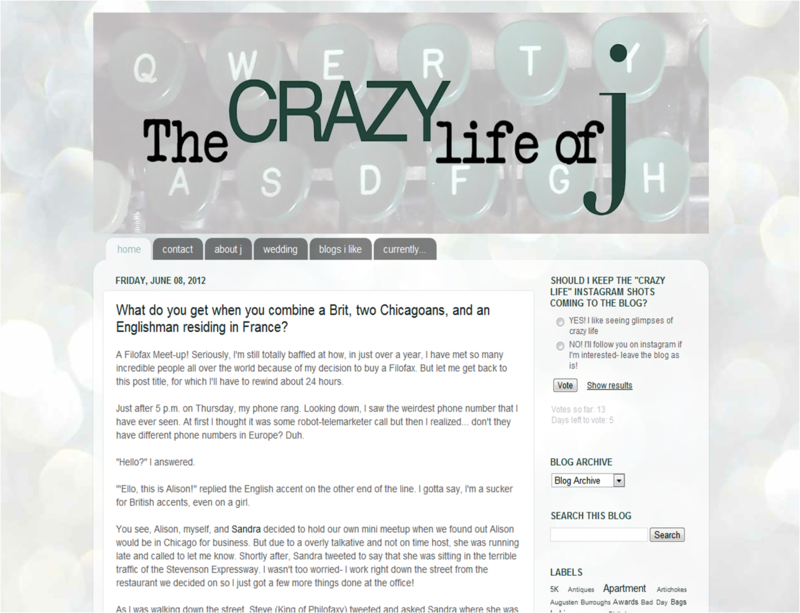 When we ended up renting an apartment by December, I changed the blog to be more focused on life in general, and The Crazy Life of J was born. As I stated above the blog was started for very specific reasons- to track our home buying progress. But since then it has evolved into so much more- a way of venting feelings, sharing awesome products and tutorials, and meeting some of the coolest Filofax nerds I know! Surprisingly, that is still my first ever Filofax related post, Finding Filofax. Even though I've moved on from my first Slate Domino, he still hangs out in my recipe cabinet! I have to cheat and list two. The first would have to be a general "life" post I did, Another Year Come and Gone, recapping all of 2011. A lot happened that year, from getting my first "real" leather Filofax, to two Filofax Meetups, to getting engaged! My favorite Filofax specific post came after the NYC meetup, when Kanalt and I did a double post on our misbehaving Maldens. Malden in Manhattan is definitely the Filofax post I'm the most proud of, even if we got some really odd looks while taking the photographs! All of the people I've "met" since starting to blog about something as off-the-wall as a planner. I get made fun of to this day for my Filofax obsession, but I really don't think those people get it! I have made some true friends through my blog and the blogs of others- to the point where we have two meetups scheduled this summer. When I look at Google Analytics, I'm still shocked to see how much of the world map is covered with page views, all because of a bit of leather and paper! I'm pretty sure the name says it all! Photos! People love to look at and respond to photos. And this is coming from a word person! But seriously, if you're taking the time to write about your set up or a new insert/gadget, take some shots and throw them on your blog as well. I always get more comments and page views on Filofax posts when I've included images. We are all nosy, and love to take a peek inside the set ups of others! My thanks to J for participating. Thanks for the feature! It popped up in my Reader this morning, and I was just like "Hey look, that's me!" Loving reading all of these, can't wait for more!